Manchester City manager Manuel Pellegrini has claimed there is ‘no problem’ with the spirit in the Etihad dressing room despite refusing to deny a bust-up between captain Vincent Kompany and Fernandinho, according to Mirror Sport. It had been rumoured that a furious argument took place in the Manchester City dressing room at half-time during their 2-1 defeat away to Liverpool. Pellegrini refused to deny the altercation happened, but played it off as commonplace in football and claimed it was time to move on. When questioned if there was a problem with spirit in the squad he said, “No, there is not any problem in the dressing room. “That happened a lot of days ago. It was just normal. In any one game, you can have a discussion between two players. It wasn’t important for the team. “They didn’t have any problems and inside the dressing room we don’t have any problems. The manager has found his own position under scrutiny recently, with the Premier League champions five points adrift of pacesetters Chelsea and staring another last 16 exit at the hands of Barcelona in the face, after a 2-1 defeat in the home leg. The Chilean’s agent had suggested that his client could be interested in the Napoli job which is likely to be vacant this summer, with an outgoing Rafael Benitez. 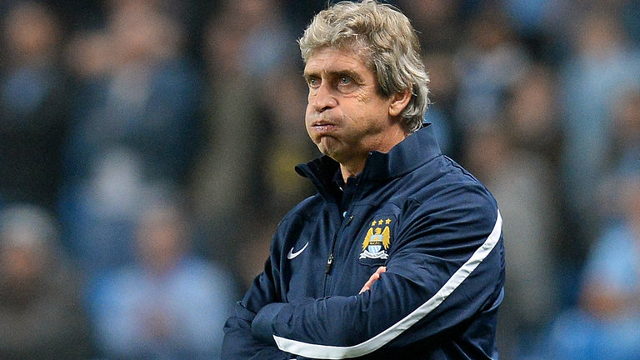 Pellegrini said, “My future is very easy. I have a contract until June 2016 and I will finish my contract here. “If I can extend my contract here I will. When I sign a contract I always try to finish my contract for the amount of years I signed at the beginning. “If I am not happy, maybe I finish my contract before [it expires]. “I don’t think the analysis of anyone can be just about trophies [if City end the season empty-handed]. But you never know what can happen in football.